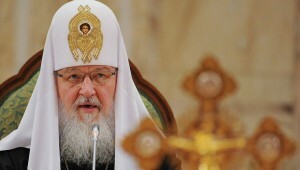 TALLINN, June 17 (RIA Novosti) – Patriarch Kirill of Moscow and All Russia has urged Estonian believers to attend church more often. “You can certainly pray at home. Some people say, ‘I am a believer but I don’t go to church.’ So why is it necessary to attend church?” the patriarch said on Sunday after a service in a newly consecrated church, whose foundation was laid in 2003 by his predecessor, the late Patriarch Alexy II, in the Estonian capital Tallinn. “Because the Gospel contains very important words: ‘For where two or three are gathered together in my name, there am I in the midst of them [Matthew 18:20],’” the head of the Russian Orthodox Church, who was on a visit to Estonia, said. “So do not be reluctant to come to churches. Remember that there, the power of another person you probably do not know… will make up for your weakness in prayer,” Patriarch Kirill said. “This is the Church’s common prayer that reaches the Lord, and the Lord answers it,” he said.